Our doctoral students are challenged to ponder the most critical issues in business management. 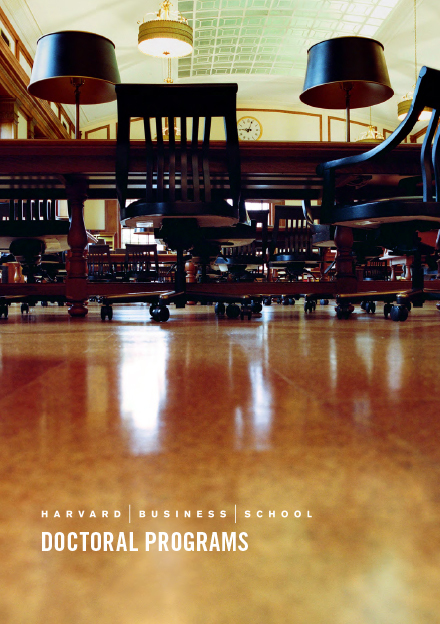 Business scholars at Harvard Business School investigate a wide range of topics and pursue questions relating to management, markets, finance, and organizations. Our doctoral students benefit from resources that are unmatched by any other school, including access to first-class research facilities, a generous fellowship and living stipend, and additional financial support for research and conference attendance. At Harvard Business School, students are challenged to ponder the most critical issues in business management and to form new insights. Our students become the next generation of faculty who will make a difference in the world through their teaching and research. Our 8 doctoral programs train students to produce innovative, rigorous, and relevant research and encourage students to become exemplary teachers at top-tier institutions of higher learning. Our doctoral students collaborate with faculty, alumni, and fellow students, and have the opportunity to engage with a community of scholars throughout Harvard University and the Boston/Cambridge area.